Please fill out the following ensuring that measurements are taken accurately using a fabric tape-measure. A fabric tape-measure – Do NOT use a Tradesman’s steel tape-measure or a plastic / wooden ruler. Someone to assist you to take the measurements. Place the tape-measure as shown in the photograph and record your measurement in cm’s. Ensure that the tape-measure is snug but not tight. Do NOT take the size from labels in clothes as sizes can vary with different brands. We require measurements taken from your actual body. Place the tape measure around the base of your neck so that it sits over your Adams apple. Ensure that you have one finger against your neck so that there is some space and the shirt neck is not too tight. Record the measurement in cm’s. The easiest way to see where to measure from is to put on a shirt or tee shirt that fits well and take the measurement from the seam where the sleeves are attached. This measurement is very important if you have very broad shoulders. 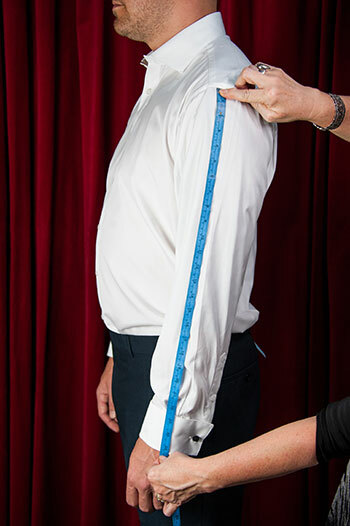 Take the measurement from the shoulder seam along the arm down to the wrist. This will determine the length of your jacket sleeve. A shirt sleeve needs to be 2cm longer. 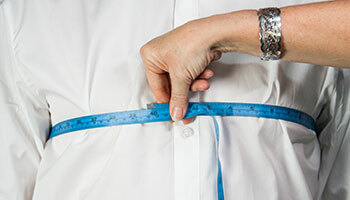 Take measurement around the biggest part of the stomach – usually belly-button height. 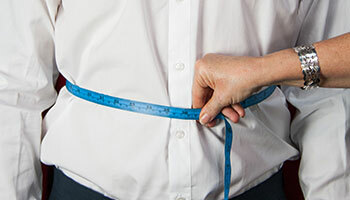 This measurement is very important to us if your tummy is larger than your chest measurement. 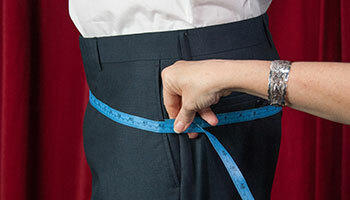 To measure for the trousers (Waist), Measure around your waist – where the waistband of your trousers normally sit. Ensure the waistband is sitting on or above your hip bone. If should NOT sit lower than your hip bone. Alternatively, measure the waistband of your most comfortable pair of trousers. 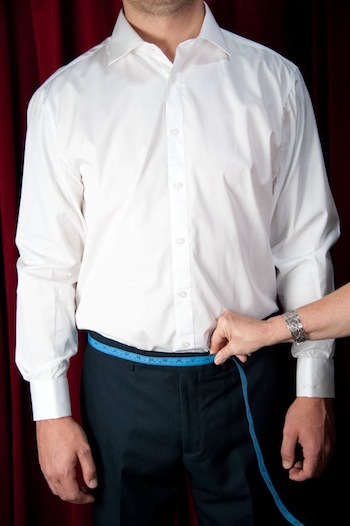 Do NOT take the size from the label of your trousers as all brands can fit differently and sizes are not always accurate – we need the measurement taken from measuring your actual body. Take measurement around the hips and the biggest part of the bum. 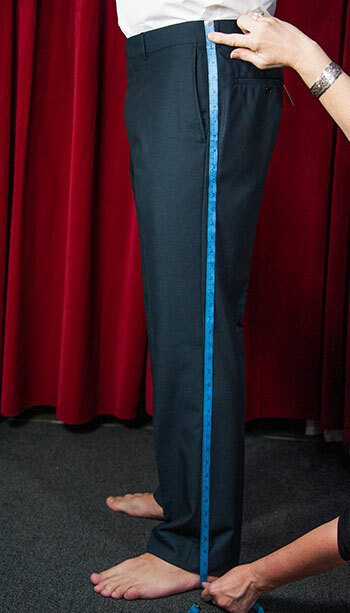 Take measurement from the TOP of the waist band to the floor. Take the measurement from the side of the body ensuring that the pants you are wearing are sitting in the correct position. The trousers should sit On or above your hip bone, NOT below it. Alternatively, if you have a pair of pants that are the exact length that you require, lay them on a flat surface and measure from the Top of the waist band down to the bottom of the leg making sure you measure along the side of the pant as in the photo. Take measurement around the widest part of the thigh. This measurement is important if you have solid or larger than normal thighs. 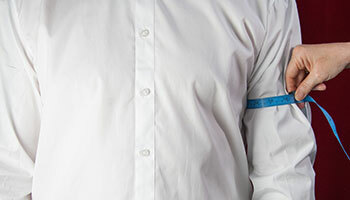 If you are a body-builder or have large biceps, this measurement is important to us as some shirt sleeves may be too tight. 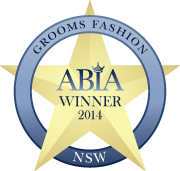 When will you be available to come into JFH for your fitting? If you have any additional information to assist us? Just For Him will make every attempt to ensure that the suit will fit you with the least amount of tailoring required, however; if at the final fitting the clothes do not fit due to the fact that the measurements sent through were not correct, an exchange fee of $25 will be charged to cover the cost of exchange. 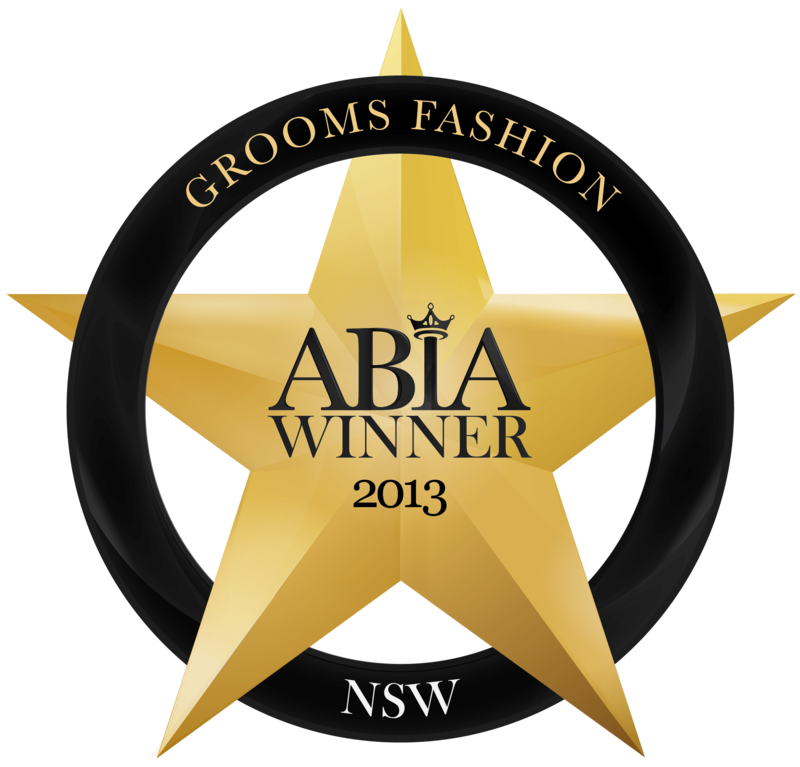 If you are unable to come to Just For Him to try on your suit / shirt / trousers etc, we are happy to send your items to you. The cost of postage / courier will be added to your account. Your items must be paid for in full prior to it being sent to you. 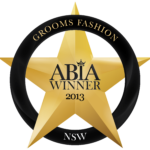 Tailoring – Just For Him has the services of an excellent Tailor. Items are collected each Saturday and returned the following Saturday. Should items be required within this time frame, a rush fee of $20.00 will be charged. Tailoring fees are NOT included in any quote. If you prefer, you may organise your own tailoring. 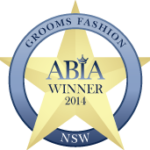 If Tailoring is required and your final fitting is within two weeks of the wedding, to ensure the garments are ready in time, a rush fee of $20.00 to cover courier costs will be charged.